The Nigerian Stock Exchange held its 55th Annual General Meeting (AGM] in Lagos yesterday where the Report of the National Council, Financial Statements of The Exchange as at 31 December 2015, and the Report of Auditors were presented to members. At the AGM, the members agreed to NSE Council’s proposal to have an Extra-Ordinary General meeting on the demutualisation to allow for more consultation. The suggestion was supported by Emeka Madubuike, President of Association of Stock Broking Houses of Nigeria and Mike Itegboje. The speakers further urged the Council and Management of NSE to fast track the demutulaisation process and pick a date for the EGM. Speaking at the AGM, the President of Council of The NSE, Mr. Aigboje AigImoukhuede, noted that the Exchange weathered the impact of capital flight shocks experienced globally through effective fiscal discipline and tight budgetary controls. “We recorded an operating surplus of N1.86 billion as a result of management diligence in managing the budget as well as strategic prioritisation and execution of key initiatives based on efficiency, scale and growth potential. Total assets of The NSE grew by over 10%, while net assets grew by 11%, year-on-year. 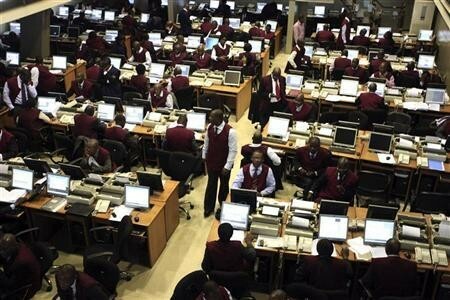 By the end of year, the Exchange’s asset base exceeded N22.78 billion, with N19.29 billion in accumulated funds, providing us adequate financial flexibility to support strategy execution in key business areas for the road ahead,” he added. According to the CEO of The NSE, Mr. Oscar N. Onyema, the Exchange illustrated its resilience during the year amidst prolonged economic uncertainty, diminishing commodity prices and volatile securities markets. “Our balance sheet remains solid, with over N22.78 billion in assets, representing a 10% growth rate in 2015. Our liquidity metrics remain strong as well, with a current ratio 3.79 and a total liabilities -to- total assets factor of 15% as of December 31, 2015”, Onyema said. At the AGM, Members of the Exchange re-elected to the National Council, Mr. Aigboje AigImoukhuede, as the President; Engr. Muhammad Daggash; Mr. Oluwole Abegunde (Representing Meristem Securities Limited); Mr. Oladipo Aina (Representing Signet Investment & Securities Limited) as members of the National Council. The Exchange offers listing and trading services, licensing services, market data solutions, ancillary technology services, and more. The Nigerian Stock Exchange continues to evolve to meet the needs of its valued customers, and to achieve the highest level of competitiveness. It is an open, professional and vibrant exchange, and the Entrepreneurial Growth hub of Africa. The Nigerian Stock Exchange aspires to be Africa’s foremost securities exchange, connecting Nigeria, Africa and the world.